Jump out of your comfort zone and take a ‘leap of faith’ to reach the trapeze bar in front of you. Not as easy as it sounds whilst balancing on a wobbly pole which is 14m high! A test of team work and trust, the objective is to get 4 people to climb the 14m pole to stand on a small platform. Sounds easy? Now try holding hands and lean back! Help each other to climb the swinging Jacob’s Ladder which gets progressively harder to climb as you get closer to the top. One person cannot do it alone – it requires problem solving, physical strength, balance, and determination. Team members must work together to build a tower of crates as high as they can. The higher the tower, the more unstable it becomes and if it topples over so does the team. A fun way to test communication and teamwork skills! Balance Beams The Inclined Log, Wobbly Beam and High Beam proves to be a real balance test. 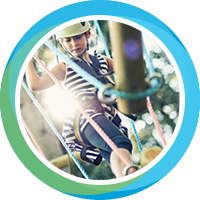 This element tends to be the most mentally challenging of the high ropes elements. Price includes Public Liability insurance, use of specialist equipment, experience and fully qualified guide.